Virtual Reality headset sales surpassed 1 million in Q3 2017, according to data from market researcher Canalys. This is a milestone for the industry with headset sales "showing no signs of slowing". Sony took the biggest slice of the pie, with the PSVR accounting for 49 per cent of the market. Interestingly we see that Oculus took second place with 21 per cent of the market and HTC following up in third place with 16 per cent. The biggest movement in the market in the most recent quarter stems from Oculus' efforts to increase its penetration. In summary, the Facebook owned company slashed its HMD kit price to $399 for a promo - a success story resulting in that price becoming permanent. 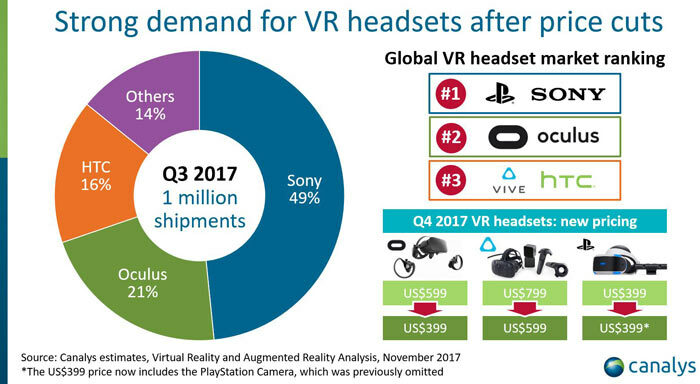 "VR adoption in the consumer segment is highly dependent on price, and Oculus’ strategy of lowering prices has definitely helped drive adoption," said Vincent Thielke, a Canalys Research Analyst. On the topic of Oculus and its plans Thielke went on to claim that next year we will see the standalone Oculus Go, priced at $199, which "will excite first-time users". Considering Sony's success, Canalys says much of it is driven from Asia. It notes that in Japan there are a number of VR experience zones which have proved popular and this has helped Sony to an 80 per cent share of its home market. 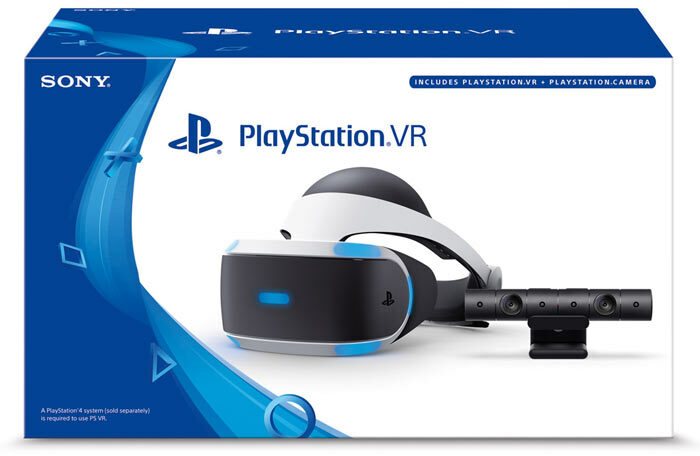 PSVR bundles are popular too, with titles such as Doom, Skyrim and Gran Turismo thrown in. Furthermore, Sony has increased the value of the PSVR by bundling the PS Camera as standard. Canalys doesn't have anything to say about the HTC Vive in its report summary. Though HTC too has increased its value proposition, it is still comparitively highly priced and well beyond impulse purchase levels for most. Looking ahead, the VR headset market as a whole is likely to benefit from the boost provided by wide distribution of Microsoft’s Windows Mixed Reality products. Top-tier PC vendors, including HP, Lenovo, Acer, Asus and Dell will be pushing for their success, as will Microsoft. Recently HEXUS reported on Apple's moves that are likely to bring a mixed reality HMD to market. Apple's clout could easily expand the appeal of VR / AR headsets even further. Sony PlayStation 5 will deliver "fundamental changes" in gaming Xbox One S All Digital launches tomorrow, says report Microsoft intros slimmer and lighter modular Surface Hub 2S Apple and Qualcomm end litigation battle QOTW: Which games consoles do you own? so did the headache medication companies.